The year was 1965. I thought I was the only skater around, with my father, of course. We were riding wood boards with clay wheels and reading a black and white skateboarding magazine that lasted a couple of issues (written by the Brothers De Rosnay) and I did not really think it was a big deal. Actually, it was not: skateboarding quickly died just after it was born. But, who cared? We loved skateboarding and we thought we were the only survivors of the era. When Larry Stevenson invented the kick-tail in 1969 we did not even know. Actually, we rode flat skateboards well into the first part of the 70’s. When Larry Stevenson started MAKAHA skateboards he did not know he was inventing an iconic brand. Larry Stevenson is credited with being the man who made the first high-quality skateboard. He managed the first skate team in 1963, and held the first skateboard contest in 1963. Larry Stevenson is also well known for publishing Surfguide magazine during the 1960s: well into surfing, he started making boards by hand in his garage in Santa Monica and soon had the top surfers riding Makaha boards. Mike Hynson, Phil Edwards, John Peck, Mike Doyle, Dave Rochlen Jr., Mike Purpus and L.J. Richards all rode Makaha. Larry put together the first skateboard exhibition team in 1963 with Skateboard Hall of Fame Member Bruce Logan, Woody Woodward, Danny Bearer, Scott Archer, Gregg Carroll, John Fries, Joey Saenz, George Trafton Jr, and Squeek Blank. Larry’s second-generation Makaha team of Ty Page, Bruce Logan, Rusty Henderson, Mike Purpus and yet another Skateboard Hall of Fame Member Torger Johnson was put together to promote the inventions that changed skateboarding forever. During the 1980s and 1990s Larry was still involved with surfing and skateboarding and created Poweredge skateboarding magazine. 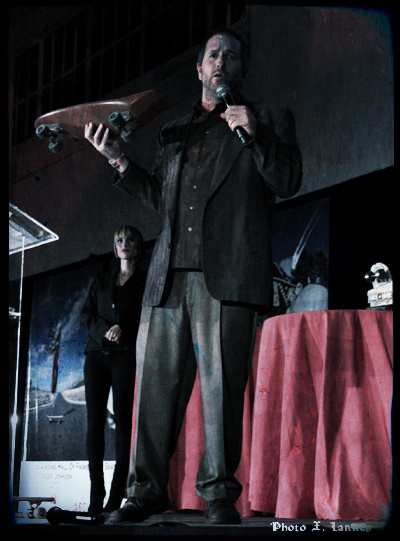 At the last Skateboarding Hall of Fame in 2010, Stevenson’s son (on the left) recalled when his father Larry Stevenson was editing Surf Guide before being sued by John Severson and Surfer magazine over a futile dispute. I’m so glad Larry Stevenson got a lifetime achievement award for his contributions to skateboarding at the 2010 Skateboarding Hall of Fame… Larry believed in skateboarding when nobody did and now, more than 25 million skaters are roaming the streets everywhere around in the world. I’m so sad because he is now gone forever. December 22, 1930 - March 25, 2012.